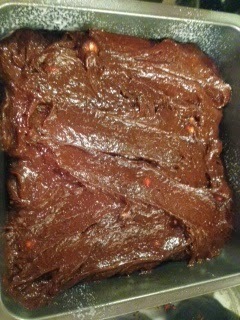 These are based on the salted caramel brownies that Alexa Chung made on the recent Comic Relief Great British Bake Off. 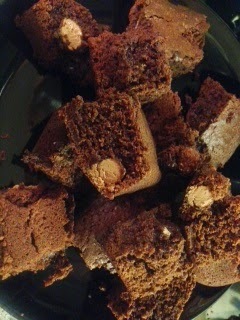 I made them for my boyfriend’s birthday as I wanted him to have something nice in his lunchbox at work; they also made for a quick dessert that evening at home (we had his family over for dinner). And they tasted amazing! 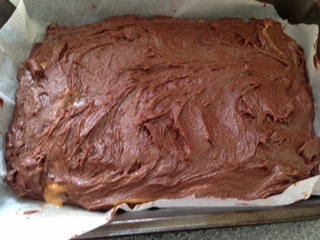 I followed the recipe which is here, though as I was short of time I used a tin of Carnation Caramel as the filling, which worked perfectly. 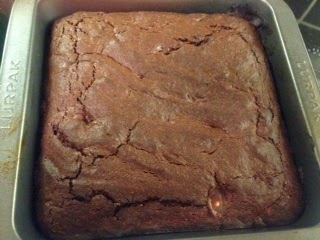 I also added a little condensed milk to the brownie mixture as I had a tin open from another recipe and thought it might be nice! 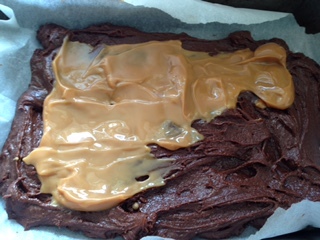 Brownie mixture coming together – After preheating the oven, I spread half the brownie mixture into a greased pan and spread the caramel on top. 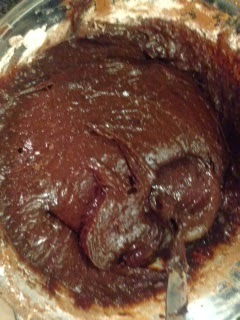 Then cover with the rest of the brownie mixture so there are no gaps. 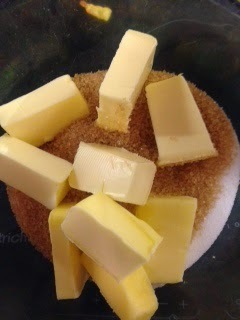 When it has cooled, drizzle with melted white chocolate. 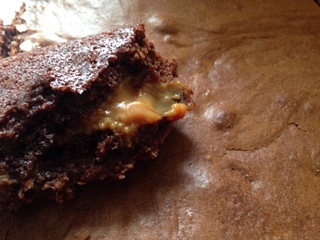 You can see the caramel in the middle – these tasted amazing! Cadbury’s Mini Eggs are very popular in my house and the fact that they are only available around Easter makes them extra special! I bought a couple of packets and wanted to use them in baking – then my boyfriend ate them, so I bought some more – then he ate those, so I bought some more! 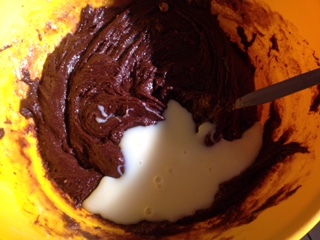 Eventually I got around to choosing a recipe and for me there was one clear winner – Mini Egg chocolate brownies. 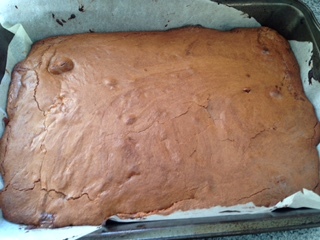 You can add Mini Eggs to any chocolate brownie recipe; I used Nigella’s everyday brownies recipe which you can find here. 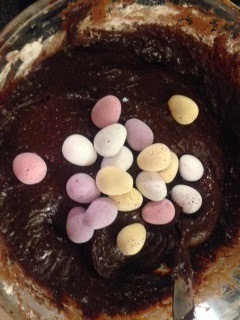 In retrospect what I should have done is saved some of the mini eggs and added them on top of the part-baked brownie five minutes before the end; this would have ensured there were some to decorate the top as they all sank in! 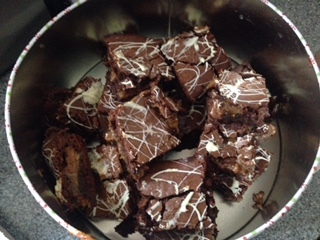 You can see the mini eggs inside the brownies though: and they did taste very good. 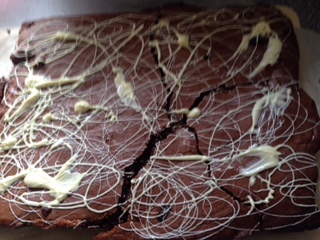 Have you tried adding mini eggs to chocolate brownies?